With all these Discography Threads (Band and Singer Reviews) that we do here at Penny Can, I'm faced with how I feel about certain albums that I have a fondness for and where Rolling Stone Magazine places them on their own Top 500 List and how I disagree with a lot of their picks and placements. 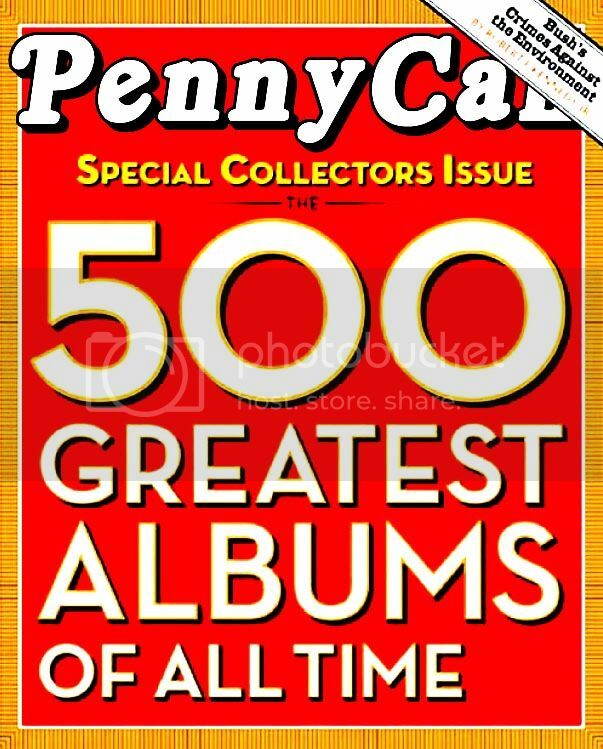 So, I aim to correct their messed up list with the official Penny Can's Top 500 Albums Of All Time list. So, what is your Top 500? As for me, this is definitely going to take a long time to fill out. You don't have to name 500. You can name your Top 10 or Top 20 if that's all you can come up with. Since I am going to shoot for 500 and put Rolling Stone in its place, I will first add Albums that I think deserve to be there. Once I have enough candidates, only then will I begin to sort out the order. Are there any parameters or limits? Rock only? released this decade, bootlegs, greatest hits... OK, so no greatest hits. Live albums? Abba? Disco? I would think anything can be here except greatest hits. It's any genre from Metal to Rock to Blues to Country to Jazz. Whatever floats your boat is acceptable. Even Soundtracks are included since there are composers that I love with regards to Movie Soundtracks. But as you mentioned, I think Greatest Hits packages don't qualify as it's not representative of what the band or artist had in mind when putting together their studio albums. Time Frame: From the year of Adam and Eve.....all the way to present day can be included. Might I suggest you keep posting as you remember great albums, but update your original list too, so we can see that list expand. Yes, I am including these as well since they had just as much impact on me as a studio album by a band or singer. These Soundtracks are not to be confused with the more typical type of Soundtracks that just have songs on them and add nothing to the movie. The three that I listed are integral to the film itself and therefore qualify. Well, Top 9.....it's a start. This is f*cking hard to do. Ack! FYI, coming up with 500 and putting them in order is next to impossible!